•Lens and frame are vented to increase air flow. •Provides 100% protection from harmful UV-A and UV-B rays. •Headband features ratchet adjustment for perfect fit. •Foam padding forms a perfect seal to keep out dust and airborne particles. •Headband features quick fit retainer. 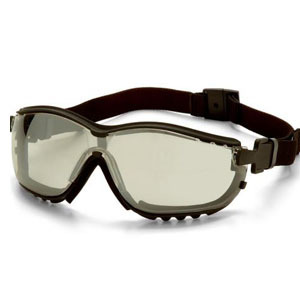 •Meets MCEPS (Military Combat Eye Protection Systems) Ballistic Fragmentation standards. Class 1 & 3.